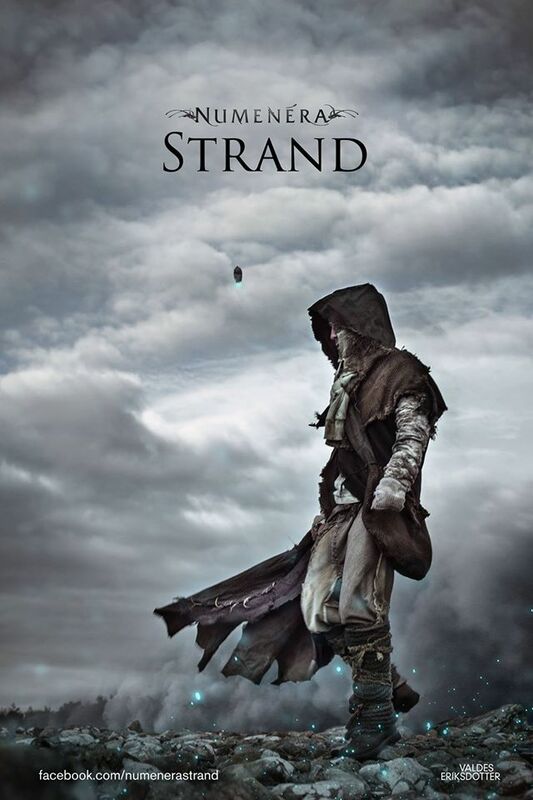 Numenera: Strand proved a useful touchstone yesterday for kicking off an adventure in the Ninth World. I always answer any questions the players have about the situation that their characters find and the world around them, but Numenera: Strand was a neat way of setting the scene and the tone. A 10-minute video with just enough narrative and atmosphere to get the Numenera setting fixed inside your head – that works for me. It’s crowd-funded money well spent as a tool – and it’s more than I could muster for scene-setting (despite having quite the reputation for tabletop bling, especially for games like the Cypher system and Symbaroum) with those new to the Ninth World. Combined with the Numenera: Starter Box, you have an ideal in. I had three players and having selected characters – a Nano, a Jack and a Glaive (Haro, Uraz, and Tanasia) – I set the tone. Well, I say set the tone. I think we were all in a surprisingly chipper mood last night, so low-key humour stuck around the whole session. That aside, I managed to use Numenera: Strand as a satisfying hook into the first session. The sudden appearance of a massive floating artefact over the Steadfast after the discovery of the first silver shell cypher had set authorities and treasure-seekers to a certain task – find more shells! The Order of Truth were keen to collect both the shells and the black boxes that appeared when the silver cyphers were activated and called the floating artefacts. Authorities had voiced their concern about the well-being, safety and security of their populations; while many nobles had joined the treasure-seekers in tracking down other shells. The party of three had ventured into the wastes beyond the south of the Steadfast, into the Cold Desert. They had been travelling out for weeks from Qi, the capital city of the Steadfast, and had got a lead from an informant called Stan, a friend of Haro. Alas, when they arrived in the settlement of Norwich, Stan admitted she’d lost track of the shell’s whereabouts after a violent encounter with a mercenary group she referred to as the Crows. The inhabitants of Norwich had repurposed the shells of giant snail-like creatures as accommodation, draping the entrances with canvas, cloth or synth sheets. They appeared troubled and scared. Before meeting Stan and one of the local Aeon Priests, Larry, Haro noted that the snail shells formed a spiral, growing outward from the brick Clave at the heart of Norwich – which meant the homes themselves and their layout mirrored the spiral on the outside of the black boxes dropped by the artefact. Daft names aside – with Glen, Les, Colin, and Allan to follow – the group managed to get a taste of an awkward situation and a significant threat, but struggled to care about anything but the silver shell. Where’s are the shins in it for me? Well, we’ll see next week. System-wise, I’m rusty and I didn’t have quite the energy necessary to enforce the rigours of the system. Roll a d20 – low and you fail, high and you succeed; that’s about all I could manage for the first session. Next time, I will approach the mechanics a little more conscientiously. 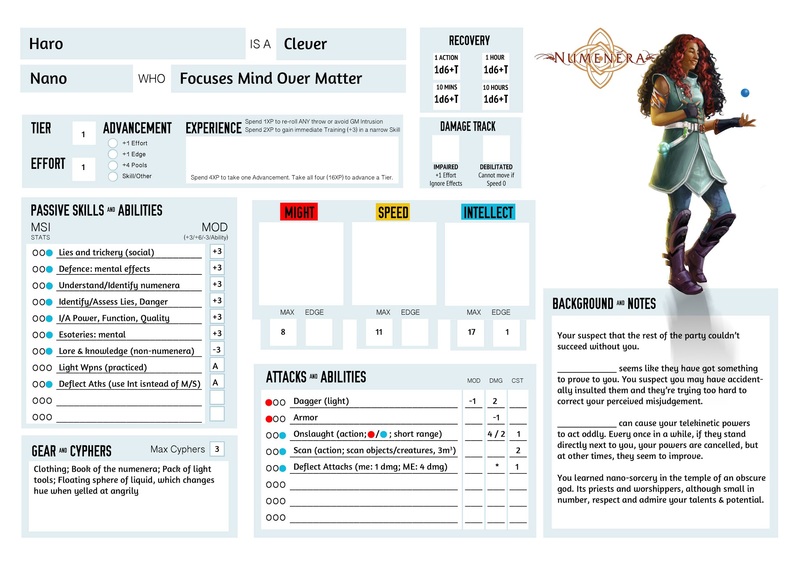 As I say, Numenera: Strand proved very useful – and I’m interested in hearing how other people might use it. Where is that character sheet from? I created the character sheet myself. I have been experimenting with a different format for a while. I adapted the Numenera version from one I used to run Cypher System.